Sam Wildow | Daily Call Woods Walk Farm Bed and Breakfast, 9111 W. Miami-Shelby Road, Piqua, runs almost entirely off solar energy. 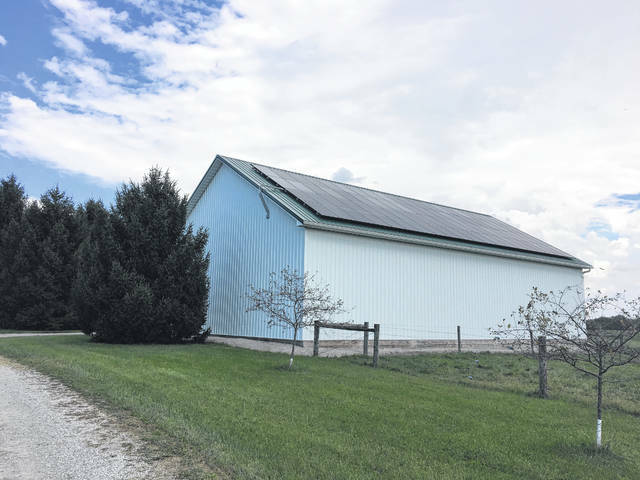 Sam Wildow | Daily Call Solar panels on top of the barn at Woods Walk Farm Bed and Breakfast, located at 9111 W. Miami-Shelby Road in Piqua. 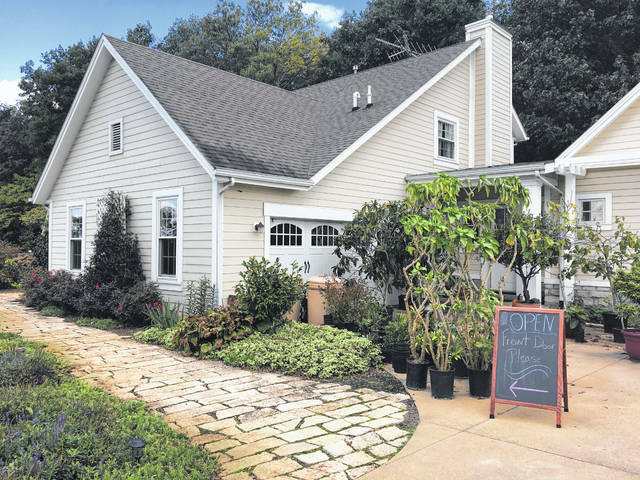 PIQUA — A local farm and bed and breakfast participated in a National Solar Tour over the weekend. Woods Walk Farm Bed and Breakfast, located at 9111 W. Miami-Shelby Road in Piqua, runs almost entirely off of solar panels on top of their barn. “We put our solar in about three years ago,” said Mary Haldeman, who co-owns and operates Woods Walk Farm with her husband Mark. They offered an open house over the weekend as part of a National Solar Tour to people who wanted to stop by and learn about their farm and how it runs off of solar energy. The solar panels are a part of their larger goal of sustainability and being environmentally conscious as they use almost no fossil fuels, grow the majority of their own food, and utilize compost piles. Haldeman does not buy pre-made food. They also burn what trash they can in addition to creating compost piles and recycling other items, leaving them with only having to take out the trash twice a year. The Haldemans also do not pay for other utilities as Woods Walk Farm has its own well and septic tank. The Haldemans do utilize about a half a tank of propane each year to heat water for their shower and dishwater, but the rest of their property operates off of the electricity generated by the solar panels. Their washer and dryer are also energy efficient. The farm also has a new commercial greenhouse, which is also going to be solar powered. Reaching this point of sustainability has been a process, though. The Haldemans purchased the property that became Woods Walk Farm in 1999, and they have just recently reached this point of sustainability. Mary Haldeman explained that they began with their garden and growing their own food, saving on money at the grocery story. She added that the federal government offers a 30 percent tax credit, which she said goes through 2019, to property owners who utilize solar panels. Their farm, which also operates as a bed and breakfast, sits on 60 acres of land that includes 40 acres of woods with trails. The farm also features 250 apple trees where customers can come and pick bushels themselves. They are also planting an area where customers can pick their own berries in the future. “The bed and breakfast is to help people recenter,” Haldeman said. For more information about Woods Walk Farm Bed and Breakfast, visit woodswalkfarm.com or call (937) 541-1105. The National Solar Tour was sponsored by the American Solar Energy Society and Solar United Neighbors, the National Solar Tour is the largest grassroots solar event in the United States. This year’s tour featured more than 600 sites in 48 states. https://www.dailycall.com/wp-content/uploads/sites/30/2018/10/web1_Woods-Walk-Farm-1-cmyk.jpgSam Wildow | Daily Call Woods Walk Farm Bed and Breakfast, 9111 W. Miami-Shelby Road, Piqua, runs almost entirely off solar energy. https://www.dailycall.com/wp-content/uploads/sites/30/2018/10/web1_Woods-Walk-Farm-2-cmyk.jpgSam Wildow | Daily Call Solar panels on top of the barn at Woods Walk Farm Bed and Breakfast, located at 9111 W. Miami-Shelby Road in Piqua.